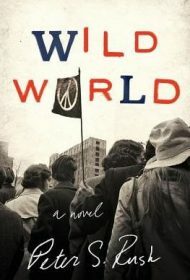 Peter S. Rush’s novel Wild World, set in the early 1970s, centers on an idealistic antiwar activist who chooses an unusual path for himself. Steve Logan makes a peculiar career choice after graduating from elite Brown University. His head stuffed with world-saving ideas from a New York cop and a dreamy Brown professor, he forgoes law school at Georgetown to become a Providence, R.I. police officer and singlehandedly clean up the mess in one of the country’s most corrupt cities. Quickly, this baby Serpico faces dangerous antagonism from his bribe-taking, prisoner-bashing, blue-collar fellow officers and resentment from his old anti-Vietnam war comrades back on campus—even his pseudo-Marxist girlfriend, Roxy Fisher. He’s stranded on the fringes of two worlds. As the story evolves our hero manages to uncover a filthy conspiracy involving local politicians, the police department, Providence’s mob family and his old alma mater. This is a fast-paced story with compelling soft-boiled prose: “He loaded . . . putting the four jacketed bullets in first and the hollow point last. If he needed a fifth shot, it was going to end any conversation.” The author also shares some key history with his hero—Brown grad, ex-Providence cop—that points at elements of autobiography and authenticity. Wild World would be improved with a less sanctimonious protagonist at its center. Still this is a well-written novel—one rich in period detail and dramatically dynamic.